Did you get your DVD or Blu-ray copy of The Bible yet?? 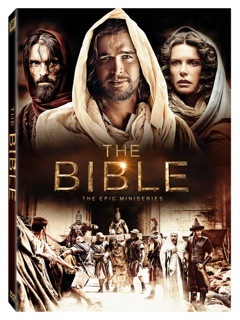 If not, you are in the minority, it seems, because the epic miniseries, THE BIBLE, continues its unprecedented success with its home entertainment launch and quickly became the biggest selling TV on DVD in the last 5 years and the biggest miniseries of all time on Blu-ray™, Digital HD™ and DVD in its first week of release. 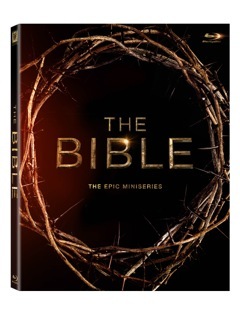 THE BIBLE series is flying off store shelves around the country with 525,000 units sold. According to the Association for Christian Retail (CBA), THE BIBLE is the fastest pre-selling faith based title in its 60-year history. THE BIBLE also ranked #1 across digital stores including iTunes, Amazon, VUDU, Xbox, PlayStation, CinemaNow, and GooglePlay. From its early debut last July at The International Christian Retailers Show (ICRS), to the unparalleled praise from notable spiritual leaders as Joel Osteen, T.D. Jakes, Samuel Rodriguez, Cardinal Wuerl and Rick Warren, to receiving The Parents Television Council 2013 Seal of Approval, THE BIBLE has ignited discussion across the country about the greatest story ever told. From Executive Producers Mark Burnett (The Voice, Survivor) and Roma Downey (Touched by an Angel), THE BIBLE is an epic 10-part miniseries which retells the stories of the Bible, from Genesis to Revelation. The four-disc Blu-ray™ and DVD set dives deeper into the making of the series and features a behind-the-scenes look at how the ground-breaking miniseries came together. After being named the official app of THE BIBLE series, YouVersion's Bible App had its biggest month ever, reaching 88 million total installs, breaking into the top 15 of all free apps in the iTunes App Store, and seeing 3.4 billion minutes of Bible engagement in the app. A STORY OF GOD AND ALL OF US: A NOVEL BASED ON THE EPIC TV MINISERIES “THE BIBLE” by Roma Downey & Mark Burnett instantly became a national bestseller. The book debuted at #6 on the Publishers Weekly Hardcover Fiction list and spent multiple weeks on the New York Times Hardcover Fiction list. THE BIBLE series also continues to exceed rating expectations around the world with premieres in Spain, Columbia and Portugal that brought in viewership that dominated and lifted the series to #1 and beating the top rated programming in each of those countries. In Diogo Morgado's Portugal, a large protest via Facebook prompted SIC to reschedule the series to air in the afternoon over Easter weekend. This resulted in great success for the channel and a whopping 37% market share. And more international territories continue to acquire the series including Greece, Croatia, Holland, Brasil, France and the UK where it was announced today that THE BIBLE will premiere on Ch. 5 this fall.